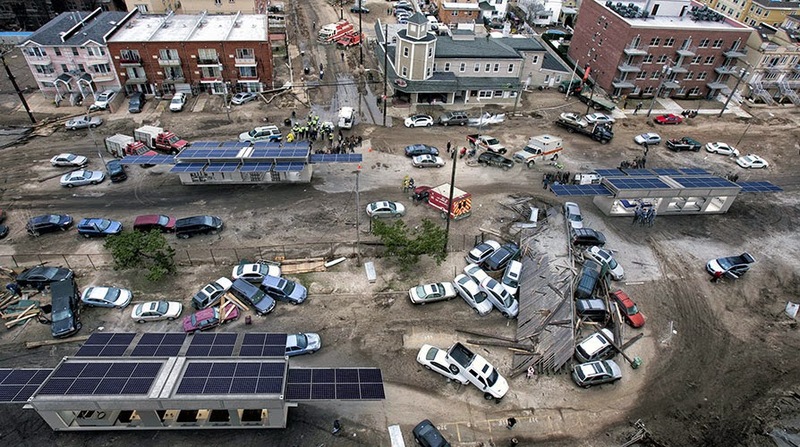 One of the challenges of humanitarian relief efforts to disaster sites is that whatever event has necessitated the relief (hurricane, tsunami, rain of toads) tends to play merry hell with local power generation and local infrastructure. One company, Ecosphere Technologies, believes it’s designed a solution to that problem. The company’s new Ecos PowerCube is designed to deliver solar power to off-grid areas, along with water purification facilities and WiFi base stations all in a single shipping container package. The Ecos PowerCube will be available in three sizes and is designed to fit into 10-foot, 20-foot, and 40-foot shipping containers. The largest models can generate up to 15kW of power, though the implication is that the PowerCube will also use that energy for wireless communications or a mobile water treatment (an energy intensive task). 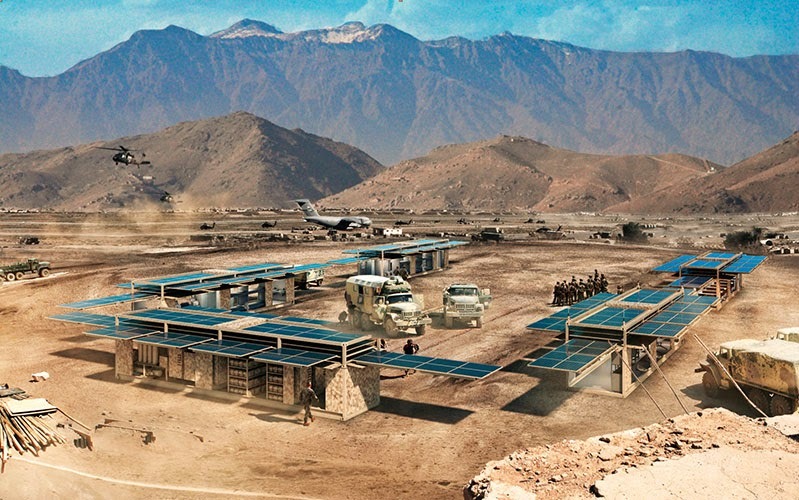 The entire system is designed to be flexible; the PowerCube is listed as being capable of supporting multiple missions, from hospitals and sleeping quarters, to providing water treatment or internet. It’s worth noting that Ecosphere, the company, appears to have previously focused on mobile water treatment, implying that these other features have been integrated into the PowerCube to provide a bit of helpful manufacturing synergy. 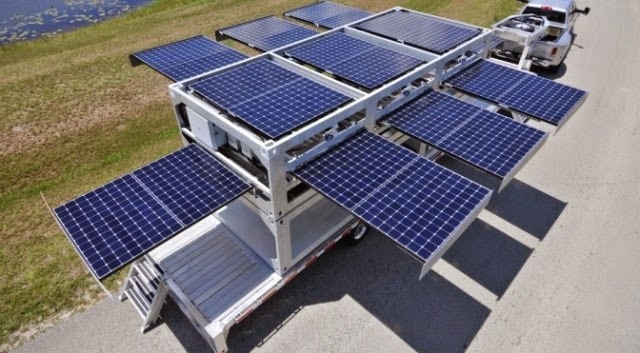 By using fold-out solar panels, the team has significantly boosted total power generation without compromising the handy shipping container form factor but there is a catch to this two of them. First, there’s no included batteries (or at least, none listed). One of the other downsides to major disaster areas is that time is often of the essence; the window to treat wounds and rescue buried or trapped individuals is fairly small typically less than three days. That means work needs to continue straight on into the night, and the Ecos PowerCube is only capable of providing power when the sun is shining. Useful? Definitely but they (and solar in general) aren’t a one-size-fits-all solution. The other problem is that a diesel engine in a shipping container can kick out between 600kW and 1.7MW depending on size (the Ecos PowerCube, by comparison, outputs just 15kW. That’s a rather steep difference and while it’s absolutely fair to point out that the diesel generator requires fuel (whereas the PowerCube doesn’t), the flip side is needing to move 20+ PowerCubes to equal the output of one diesel generator. Ultimately, this comes down to a question of need and capability. For small scale installations that require both WiFi and water reclamation, and can provide independent nighttime power generation, the Ecos PowerCube might be a great niche product. Unfortunately the limited power generation and apparent lack of integrated Li-ion batteries are going to make it a difficult sell for most of its intended markets. While the company claims military installations and third-world nations might also benefit from its hardware, both of those groups will be interested in nighttime power capability as well.